The latest offering from Bad Panda Records is this track by All India Radio who are a three piece from Melbourne, Australia. They have been around since 2000 and have released six albums over that period. This track however is probably the most beautiful thing they have ever created. "Lucky" originally appeared on their last album "A Low High" which was released back in January. The Graceful Slicks are new on me but they had the good grace to send me this track which is taken from the Oxford band's new demo. Yes yes I know, any excuse to play a Fall track. This was, and still is the b-side from their debut single "Bingo Masters Breakout" back in 1978. I've always been a sucker for samples & spoken word stuff in songs so it was probably inevitable that this track would appeal. It comes from a compilation on called "Soundbites Volume 1" which is the first in a series of compilation E.P.s to be released through Lightspeed Recordings. Also featured on this volume are tracks by Fromage Disco, Wowlace and Dancecamp. This track is taken from Sophie's "Apples E.P." which to quote from the press release "was recorded live in a living room, by a river, using a couple of mic's, a borrowed guitar and a cup of tea." The E.P. is released on Rainboot this very week and is well worth further investigation. This is the first track to be heard from the new Mickey Brown album which will be called "Soul Glo" and follows their "Vision Quest" album earlier this year. Two albums in one year! This is the first release from New Rochelle based Patrick Kelly who records under the moniker Summer Library. This is one of two tracks on this release which you can download for free from the February Records website. I can't tell you anything about this, largely because all the info (including song titles) is in Japanese which is not my strongest language. What I can tell you however is that it comes from a for track E.P. called "Straydays" which is bloomin' brill. This is a track from the new release by Mutual Benefit. It's called "Spider Heaven" and is a six track E.P. released on the increasingly popular cassette format next week. Fortunately for those people who can't play cassettes it is also available digitally through the bands Bandcamp page. This is a track from the debut single by Katy Goodman who was and probably still is in Vivian Girls. It will be released on 16th November as a seven inch single on the Hardly Art label and I'm told there will be an album at some point next year which on the strength of this should be a treat for all. 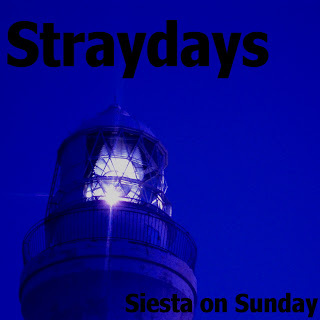 track 3 from siesta on sunday's "straydays" ep is "natsu no owari no shoegazer", which means "a shoegazer at the end of summer".